If not for happenstance and King Taco, there would never have been a “Cincuenta Taquerías” project. Happenstance sent me out to work in East Los Angeles. Searching out the most efficient commuting roads led me to East Olympic Boulevard, the artery of an area Great Taco Hunt’s Bandini has termed the “Taco Mecca”. East Olympic Boulevard hosts an eye-catching preponderance of taco vendors, and after a hundred trips down East Olympic Boulevard, I could not escape taco captivation. Perched beneath a roughly 400-foot-tall sign that towers over Interstate 5 is the most eye-catching taco stand of all. You’ve probably seen it from the freeway. 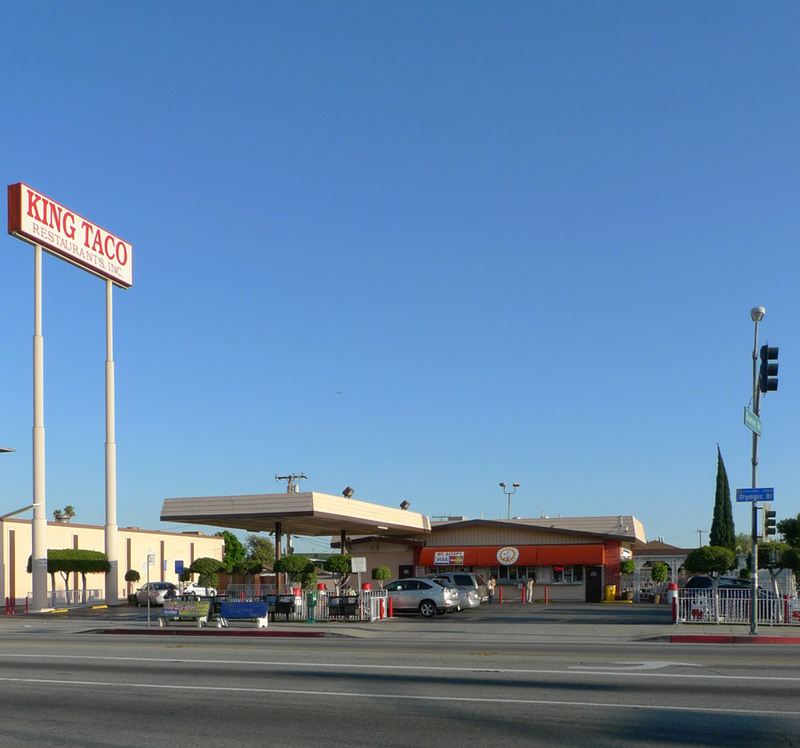 Tonight on my way home I finally stopped at King Taco #15, a classic outdoor-seating taco stand at the heart of Taco Mecca. I did so with low expectations – King Taco is a chain restaurant with 20 locations and its own Visual Corporate Identity program; and although its Mexican-style soft tacos have nothing in common with Taco Bell or Del Taco, I had been to a King Taco once before a year earlier (King Taco #27 in Long Beach) and been disappointed by small, boring tacos with bad tortillas. Tonight, however, I experienced nothing but taco bliss. I don’t know what went wrong that other time. For the urban cyclist, a classic taco stand has one obvious advantage – you can order and eat outside without locking up your bike. It was about 68 degrees when I sat down next to my bicycle at the taco table, a slight breeze and a lowering sun both coming at me from the west, and the gentle whoosh of the Santa Ana Freeway 50 yards to the east. The environment of King Taco #15 felt perfect, like a taco holy land. Eating there alone I felt the same brand of solemnity one feels at, for example, the Zen Garden at the Ryoan-ji Temple in Kyoto. Only a couple other customers shared this contemplative moment with me, no doubt lost in their own experiences. I wonder whether the taquero smiled at me when he handed over the goods because he knew what awaited me. I ordered four tacos, one each of carne asada, suadero, carnitas and al pastor. They are $1.25 each and a little smaller than average. My order had been entered as “to-go” and was therefore given to me as a plastic bag containing a cuplet of red salsa and a tidy rectangle of taut aluminum foil that looked way too small to contain so much satisfaction – I was fear-stricken that I might have received only one taco. Upon opening, the four modestly sized tacos looked good, though. I nibbled a piece of suadero before I could get the camera out. So good. So therefore I had to eat the suadero first – beefy brisket with the slightly edgy quality of meat fried in oil, mildly sweet, great texture, so flavorful. I generously applied the rojo and found it to be remarkably spicy – those of you who fear the spice, take note. This taco made quite a first impression. The tortillas were hot, bilaminated, just right. I moved on to carnitas. They take it seriously here – it had the textural variation of great carnitas, comprising both the moist and the toothy-dry together. They have mastered the alchemy by which slow-cooked pork fat is transformed into porky gold. Next, carne asada presented a contrasting aspect. Greyish, finely diced and very moist and tender, the flavors were relatively restrained, with plenty of lemon and detectable salt and pepper. The spicy rojo makes this steak taco into a real powerhouse. I saved the best for last, it turned out – the al pastor was magically delicious. I picked up a piece between my fingers and studied it closely. The irregular little bit of pork was about half orange and half grill-blackened. Each little bit of pork seemed to contain a universe of flavor, waiting to be unleashed. I think I experienced a small nuclear reaction when I took a big bite. 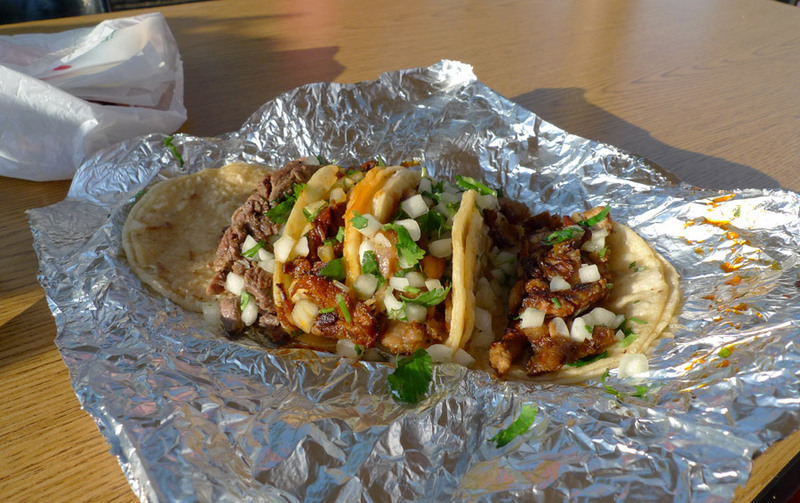 The al pastor is saucy, not dry-rubby, although not overly wet. The textural contrast within it was unusual, both tender and near-crispy. It is very sweet and very savory too. I struggled to think of what it reminded me of – the spicy mint beef at Thai BBQ? Experientially, I think it most resembled a really good plate of sautéed Tangerine Beef or Orange Beef at the kind of nice Chinese restaurant that’s in Chinatown but largely serves a gringo crowd. I would call this my new favorite al pastor, but after such a trauma I’m still in the denial stage – can King Taco #15’s al pastor really always be this good? My taco must have been a fluke. If I had to award a gold medal today for the taco all-around competition, it would go to King Taco hands-down – these four tacos were so distinct from one another, and yet all superb. King Taco #15’s lineup is now known as the Murderer’s Row, and all its members elected to the Hall of Fame. I award them the Stanley Cup, the Hugo Award, and the Nobel Peace Prize.